We did some shopping. Whenever we got out of the car there were children trying to sell us stuff, “Hey lady, ok you buy from me, one dollar.” We asked some of them their ages, and kids who look like they’re ten or eleven are fifteen. Everyone is much smaller here. 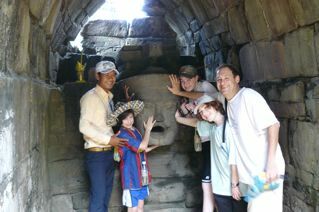 To every question we asked, our guide would answer “yes, yes of course.” I don’t think he spoke English too well. (Dad’s note – it’s true. Our guide Chanta, spoke atrocious English, almost impossible to understand, and no matter the question – even if it was not a yes/no question, the answer was ‘yes, yes, of couse’). On the subject of English, many people spoke fabulous English. 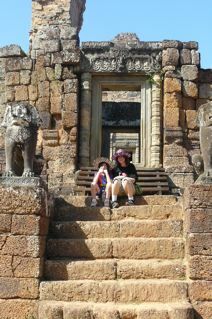 This is probably because Siem Reap is so touristy. 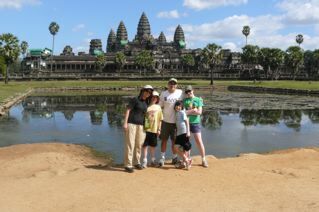 It is a city basically built on tourism, and people coming to see Angkor Wat. 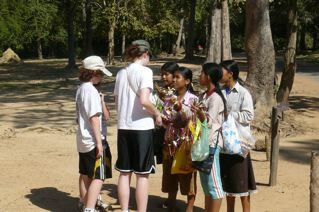 Some of the people, like the kids trying to sell stuff, speak great English. We asked them, and they also learn how to say stuff in Japanese, French, Korean, and can obviously speak Khmer (the language that is spoken in Cambodia). We went to a show a few nights ago, and it was almost as good as the Dongba show. ( a traditional music performance in Lijiang, Chine – numbingly boring) It was Cambodian dancing, but it was really boring. So we spent most of the time eating ice cream. 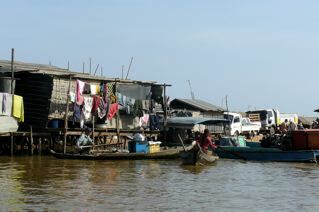 This afternoon we visited an incredibly impoverished area, called a “floating village” because all the houses are floating in the river. It was really sad. Another sad thing we did was visit the landmine museum. So many people in Cambodia are injured by landmines. You see people begging and playing music for money everywhere, all people who have lost arms or legs from land mines. 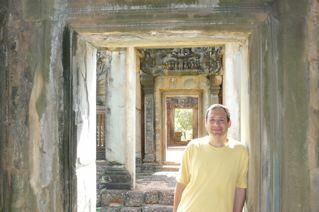 I liked visiting Cambodia, it was really different from any of the other places we’ve been to. I think it was my favorite place so far. Except for the heat. If now is the cold season, I can’t even imagine what the hot season is !